2 mins to Ngongotaha village amenities, 10 mins to Rotorua Central, 5 mins to Hamurana golfing and fishing spots. Great sporty base for the fabulous events that Rotorua offers: Crankworx, Crankworks, Moonride, Xterra, marathon, mountainbiking, cycling, walking, gondala, luge, canopy tours, maze etc. Fully renovated modern and comfortable two bedroom cottage sleeping up to 6. Separate kitchen/dining, separate lounge/living area, large modern bathroom and two bedrooms with rural views. Covered porch. Outdoor furniture, barbecue and fully fenced section on 150 acre farm. Secure internal access garage has laundry too and space for secure storage of your bikes/sporting equipment/vehicle. Private river picnic spot available by arrangement. Private setting yet only 10 minutes to Rotorua City Central. 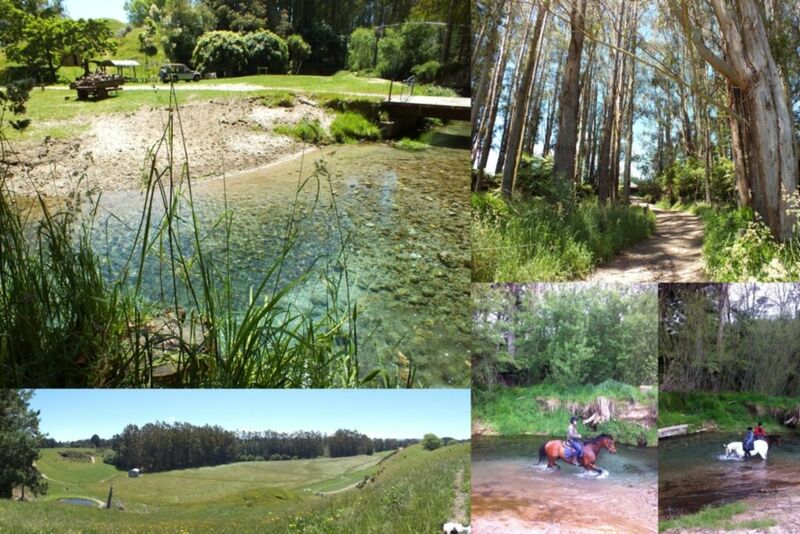 Mountainbiking and horseriding (your own horse) may be available on the farm by prior arrangement. Come and experience the rural life and still be only minutes from the cafes. This beautiful cottage will be your home-base on 60 hectares (approx 150 acres) of rolling farmland. The farm is actively and sustainably managed as a dairy support unit raising dairy heifers before they enter their first milking season. Sheep are used for pasture control around the driveways and sidlings. Please note the tariffs are based upon occupancy of up to two persons for two nights or more. An additional $10 is required for each extra adult guest andamp; an additional $10 per extra child per night. Grazing possible for horses belonging to guests ($10/horse/night). Washbay for sportsgear/horses and covered yard area available. We really enjoyed our stay and since we were out all day, we did not get a chance to walk through your beautiful property. Beautiful spot, very calm, yet near to Rotorua. The house is tidy and has everything you need. A highlight is the picnic area at the private stream, go there! Pat and Mary are wonderful hosts, very friendly and helpful. I definetely want to return! The property was very clean, well furnished and in a lovely quiet location. However as arthritic OAP's we did not like having to enter and exit the Bach through a large heavy double width garage door with a faulty handle. The barbecue was in a disgusting state and looked like it had been used but not cleaned in a long time. I took images of this right away so nobody could accuse us of leaving it like that. We were also disappointed to find we were not left even a single teabag. Thanks for your feedback, David. The single garage door handle has been repaired-thank you for letting me know. I am surprised &amp; sorry that the barbeque had been missed. The cleaner has been notified and we are implementing a system so that this does not occur again. The owners are changing the entrance so you don't have to enter by the steps. Tranquil Trees is self-catering accommodation and guests are reminded to bring everything they need to eat and drink. The water is drinking quality. Beautiful cottage with great facilities on a wonderful farm. A short drive from Rotorua, would definitely stay there again. Thank you so much.